Thank You for your purchase! Submit this form and you will be automatically directed to a download page and your free gift. Thank you so much for educating me about this problem. When my doctor advised me to visit a dietitian I decided to cut out sugar in my coffee. After about a month I had lost 5 kilos in weight and about 2 centmeters off my waistline. Then I read Sweet Poison and finally discovered Robert Lustig’s youtube presentation which led my to cutting out fruit juice and cereal in the mornings. As a consequence I have now dropped 4 centimetres from my waist and about seventeen kilos in weight. My blood pressure after stopping avapro is now constant at about 130/70, and I can now taste the difference between Shiraz and merlot. 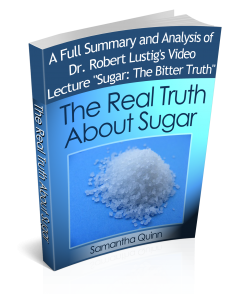 The book was an eye opener since I did not realize how much fructose is being added to so many products. Additionally the book mentioned the fact that fructose is metabolized in the liver the same way alcohol is and it is all turned into fat which contributes to plaque in our arteries and propensity to cancer. Thanks for this advice. Big time eye opener. I didn’t realize I’ve been ingesting this poison my whole life. Furthermore , feeding it to my children. Dr Lustig should get a Nobel prize. Thank you so much for telling the cold hard truth.